Resveratrol, medicine and pharmacy literature in recent years has increasingly gained importance as a secondary plant product. As first, resvaratrols in vines genotypes (V. Vinifera L.), were described in epidermis membranes of berry and leaves of grapes contaminated Botrytis cinerea (gray mold). In this article, informations were given about resveratrol. Besides, It was focused on the factors which is effective upon the formation of resveratrol and the benefits of human health of resveratrol together with its situation in wines. Resveratrol, tıp ve eczacılık literatüründe son yıllarda giderek önem kazanmış ikincil bir bitki ürünü olarak bilinmektedir. Asmalarda ilk olarak, V. vinifera L. genotiplerinde Botrytis cinerea(kurşuni küf) ile bulaştırılmış bazı üzüm çeşitlerine ait yaprak epidermislerinde ve üzüm zarında tanımlanmıştır. Bu makalede resveratrol hakkında bilgilerin verilmiştir. Bundan başka, asmalarda oluşumları üzerine etkili olan faktörler ile insan sağlığına olan faydaları ve şaraplardaki durumları üzerinde durulmuştur. Adrian, M., Jeandet, P., Bessis, R. and Joubert, M.J. 1996. Induction of phytoalexin (resveratrol) synthesis in grapevine leaves treated with Aluminum chloride (AlCl3). J. Agric. Food Chem. 44,1979-1981. Aggarwal, B., B., Shishodia, S., 2006, Resveratrol in Health and Disease, CRC Press, Taylor & Francis Group. Artés-Hernandez, F., Artés, F. and Tomás-Baerberán, F.A. 2003. Quality and enhancement of bioactive phenolics in cv. Napoleon table grapes exposed to differrent postharvest gaseous treatments, J. Agric. Food Chem. 51, 5290-5295. Bavaresco, L., Petegolli, D., Cantu, E., Fregoni, C., Chiusa, G. and Trevisan, M. 1997b. Elicitation and accumulation of stilbene phytoalexins in grapevine berries infected by Botrytis cinerea. Vitis 36 (2), 77-83. Bavaresco, L., Fregoni, M., Trevisan, M., Mattivi, F., Vrhovsek, U. and Falchetti, R. 2002. The occurrence of the stilbene piceatannol in 133- 136. Bavaresco, L., Vezzulli, S., Battilani, P., Giorni, P., Pietri, A. and Bertuzzi, T. 2003. Effect of ochratoxin A- producing Aspergilli on stilbenic p h y t o a l e x i n syntheisis in grapes. J. Agric Food Chem. 51, 6151- 6157. Bavaresco, L. and Fregoni, C. 2001. Physiological role and molecular aspects of grapevine stilbenic compounds. P: 153-182. In: Molecular Biology and Biotechnology of the Grapevine. Ed. Roubelakis-Angelakis, K. A., Ed. : Kluwer Acad Publ. Netherlands. Blaich, R., Bachmann, O. and Stein, U. 1982. Biochemical basis of resistance to Botrytis cinerea in grapevine. Bull. O.E.P.P. 12,167-170. Barlass, M., Miller, R. M. and Douglas, T. J. 1987. Development of methods for screening grapevines for resistance to infection by downy m i l d e w . I I . Resveratrol production. Amer. J. Enol. Vitic. 38, 65-68. B r i k s i n , D . P. , ( 2 0 0 0 ) . M e d i c i n a l P l a n t s a n d Phytomedicines,Linking Plant Biochemistry and Physiology to Human Health. Plant Physiology, 124:507–514. Creasy, L. L. and Coffee, M. 1988. Phytoalexin production potential of grape berries. J.Amer. Soc. Hort. Sci. 113, 230-234. Creasy, L. L. and Creasy, M. T. 1998. Grape chemistry and the significance of resveratrol: An overview. Pharm Biol 36 (Suppl. ), 8-13. Coulomb, C., Lizzi, Y., Coulomb, P.J., Roggero, J.P., Coulomb, P.O. and Agullon, O. 1999. Can copper be an elicitor? Phytoma 512, 41-46. Cheong, H., Ryu, S. and, Kim, K. 1999. Anti-allergic action of resveratrol and related hydroxystilbens. Planta Medica 65, 266-268. Celotti, E., Ferrarini, R. and Zironi, R. 1996. Resveratrol content of some wines obtained from dried vapollicella grapes: Reccioto and Amarone. Journal of Chromatography A, 730, 47-52. Dong, Z. 2003. Molecular mechanism of the chemopreventive effect of resveratrol. Mutation Research 523-524, 145-150. Ector, B.J., Magee, J.B., Hegwood, C.P. and Coign, M.J. 1996. Resveratrol concentration in muscadine berries, juice pomace, purees, seeds, Amer. J. Enol. Vitic. 47, 57-62. and w i n e s .
Falchetti, R., Fuggetta, M. P., Lanzilli, G., Tricarico, M. and Ravagnan, G. 2001. Effects of Resveratrol on Human Immune Cell Function. Life Science 70, 81-96. Fernández-Mar, M., I., Mateos, R., García-Parrilla, M., C., Puertas, B., Cantos-Villar, E., 2012, Bioactive compounds in wine: Resveratrol, hydroxytyrosol and melatonin: A review, Food Chemistry, 130, 4, 797–813. Frankel, E.N., Kanner, J., German, J.B., Parks, E. and Kinsella, J.E. 1993. Inhibition of oxidation of human low-density lipoprotein by phenolic substances in red wine. Lancet 341, 454-457. Gerogiannaki-Christopoulou, M., Athanasopoulos, P., Kyriakidis, N., Gerogiannaki, A., I., Spanos, M., 2006, trans-Resveratrol in wines Greek red and white grape varieties, Food Control, 17, 9, 700–706. Guerrero, R.,F., Puertas, B., Jiménez,M., J., Cacho,J., Cantos-Villar , E., 2010b, Monitoring the process to obtain red wine enriched in piceatannol without quality loss, Food Chemistry, 122, 1,195–202. Gürbüz O, Göçmen D, Dağdelen F, Gürsoy M, Aydın S, Şahin İ, Büyükuysal L, Usta M. 2007. Determination of flavan-3-ols and trans-resveratrol in grapes and wine using HPLC with fluorescence detection. Food Chem, 100: 518– 525. Haneke, K. E. 2002. Review of toxicological literature, trans-resveratrol (501-36-0). Integrated Laboratory Systems, P.O. Box 13501, Research Triangle Park, North Carolina 27709, Contract No. N01-ES-65402. Jeandet, P., Bessis, R. and Gautheron, B. 1991. The production of resveratrol (3,5,4'trihydroxystilbene) by grape berries in different developmental stages. Amer. J.Enol.Vitic. 42(1), 41-46. Jeandet, P., Bessis, R., Sbaghi, M. and Meunier, P. 1995a. Production of the phytoalexin resveratrol by grape berries as a response to Botrytis attack under natural conditions. J. Phytopathol. 143, 135-139. Jang, M, and Pezzuto, J.M. 1997. Assessment of cyclooxygenase inhibitors using in vitro assay systems. Meth. Cell Sci. 19, 25-31. Kimura, Y., Okuda, H. and Arichi, H. 1985. Effects of stilbens on arachidonate metabolism in leukocytes. Biochimica et Biophysica Acta 834, 275-278. Langcake, P. and Pryce, R. J. 1976. The production of resveratrol by Vitis vinifera and other members of the Vitaceace as a response to infection or injury. Physiol. Plant Pathol. 9, 77-86. Langcake, P. and Pryce, R. J. 1977. The production of resveratrol and viniferins by grapevines in responce to ultraviolet irradiation. Photochemistry 16, 1193- 1196. Lamuella-Raventós, R.M. and Waterhouse, A.L. 1993. Occurence of resveratrol in selected California wines by a new HPLC method. J. Agric. Food Chem. 41(4), 521-523. Lila, M.A., (2005). Valuable Secondary Products from In Vitro Culture. Chapter 24: Plant Development and Biotechnology. CRC Pres, pp:285–289. Kızılet, E., Anlı, R., E., 2006, Kaliteli Kırmızı Şaraplarda Bazı Antioksidan Fenolik Bileşikler, Türkiye 9. Gıda Kongresi; 24-26 Mayıs 2006, Bolu. Kimura, Y., Okuda, H. and Arichi, H. 1985. Effects of stilbens on arachidonate metabolism in leukocytes. Biochimica et Biophysica Acta 834, 275- 278. Liu BL, Zhang X, Zhang W, Zhen HN., New enlightenment of French Paradox: resveratrol's potential for cancer chemoprevention and anti-cancer therapy. C a n c e r Biol Ther. 2007 Dec;6(12):1833-6. Epub 2007 Oct 13. Okuda, T.; Yokotsuka, K. 1996. Trans-resveratrol concentration in berry skins and wines from grapes grown in Japan. Am. J. Enol. Vitic. 47(1): 93-99. Oskay, D. ve Oskay, M (2008) Bitki Sekonder Metabolitlerinin Biyoteknolojik Önemi e-Journal of New World Sciences Academy Ecological Life Sciences, 5A0006, 4, (2), 31-41. Osbourn, A.E., (1996). Preformed Antimicrobial Compounds and Plant Defense against Funga1 Attack. The Plant Cell, 8: 1821–1831. Paul, B., Chereyathmanjiyil, A., Masih, I., Chapuis, L. and Benoit, A. 1998. Biological control of Botrytis cinerea causing grey mould disease of grapevine and elicitation of stilbene phytoalexin (resveratrol) by a soil bacterium. FEMS Microbiology Letters 165, 65-70. Pezet, R.; And Cuenat, PH. 1996. Resveratrol in wine: extraction from skin during fermentation and post feımantation stan- ding of must from Gamay grapes. Am. J. Enol. Vitic. 47(3): 287-290. Renaud S, De Lorgeril M. 1992. Wine, alcohol, platelets and the French paradox for coronary heart disease. Lancet, 339: 1523-1526. Sarig. P., Zahvi, T., Zutkhi, Y., Yannai, S., Lisker, N., and Ben-Arie, R. 1996. Ozone for control of post-harvest decay of table grapes caused by Rhizopus stolonifer. Physiol. Molecular Plant Pathol. 48:403-415. Sarig, P., Zutkhi, Y.,Monjauze, A., Lisker, N. and Ben-Arie, R. 1997. Phytoalexin elicitation in grape berries and their susceptibility to Rhizopus stolonifer. Physiol. Mol. Plant Pathol. 50, 337-347. Siemann, E. H. and Creasy, L. L. 1992. Concentration of the phytoalexin resveratrol in wine. Amer. J. Enol. Vitic. 43, 49-52. Stervbo, U., Vang, O., Bonnesen, C., 2007, A review of the content of the putative chemopreventive phytoalexin resveratrol in red wine, Food Chemistry 101, 459-457. Teli, N.P. and Timko, M.P., (2004). Recent developments in the use of transgenic plants for the production of human therapeutics and biopharmaceuticals. Plant Cell, Tissue and Organ Culture, 79:125–145. Threlfall, R.T., Morris, J.R. and Mauromoustakos, A. 1999. Effect of variety, ultraviolet light exposure, and enological methods on the trans- resveratrol level of wine. Amer. J. Enol. Vitic. 50 (1), 57-64. Verpoorte, R., Heijden, R., Hoge, J.H.C., and Hoopen, H.J.G., (1994). Plant cell biotechnology for the production of secondary metabolites. Pure and Applied Chemistry, 66:2307-2310. Verpoorte, R., Heijden, R.V.D., Hoopen, H.J.G.T. and Memelink, J. 1999. Metabolic engineering of plant secondary metabolite pathways for the production of fine chemicals. Biotechnol. Lett. 21, 467–479. Waterhouse, A.L. ; Lamuela-Raventos, R. M. 1994. The occurrence of piceid, a stilbene glucoside, in grape berries. Phytochemistry. 37(2): 571-573. ISNAD Göçmez, Arzu , Seferoğlu, H. Güner . "ASMALARDA RESVERATROL İÇERİĞİNİ ETKİLEYEN FAKTÖRLER VE İNSAN SAĞLIĞINA FAYDALARI". 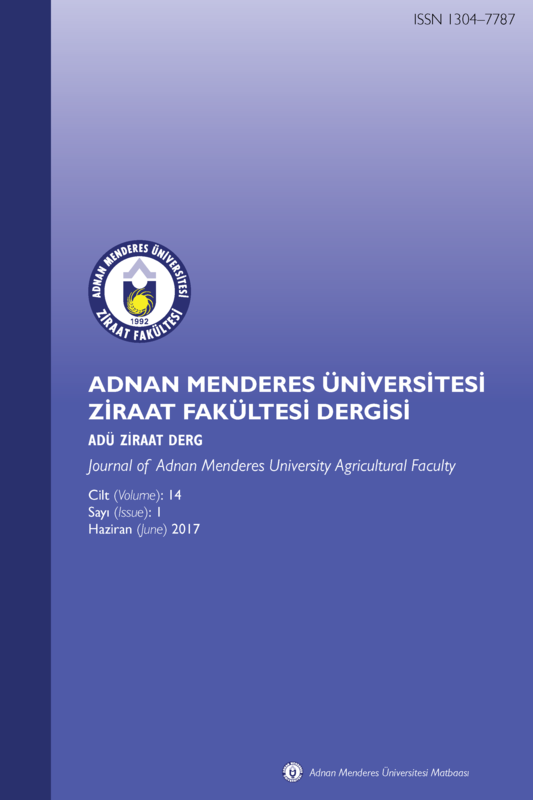 Adnan Menderes Üniversitesi Ziraat Fakültesi Dergisi 11 / 1 (March 2014): 31-38.